One good use of blogs, I suppose, is to let people know when you’ve finished a project. Or maybe it’s just a way to celebrate finishing one even if no one else cares. Either way, project #2 is done. Or at least as done as a website ever gets. They are continually under construction. But this one’s pretty done. Medium well, at least. The new Moyers Sound Solutions site is the subject of my salient soliloquy. You can see it here in all it’s glory. For anyone else traveling next week, I will be at WFX, the Worship Facilities Conference and Expo, in Houston. Moyers Sound has a booth there and I’ll be hanging out talking with church tech people. If you’re in Houston and would like to attend the Expo free of charge, let me know and I can send you a link that will get you through the gates. I guess I took a step this past weekend. Burke Brack was leading worship at GCR and they were short on tenors. He asked if I’d sing with the team. I haven’t been on that stage in, well let’s see… almost 15 months. I did not want to go up there because I knew my heart would not be right. I still had some troubles, but overall it went well. Over the past few days, I’ve found myself in a cycle of depression, anger and confusion. I am told this is normal in my circumstance (loosing my job, for those of you who have not read down further). I’ve caught myself blaming God, then feeling guilty for thinking those thoughts, then blaming myself, then feeling stupid. Then I’m usually hungry. Some things never change. Then this morning I picked up a book that I was reading and had set aside for a while, Richard Foster’s Celebration of Discipline. I vaguely remembered that where I left off had seemed something that I wasn’t catching. The importance of it had not settled into me. So I opened up the dog-eared page and looked at the title of the section where I had quit reading. And so I quietly wait. I am dust. I began this blog in early October of ’06 partly as an attempt to chronicle a life change. I was searching for a new job. It seems this blog is still needed for that purpose. Nine days ago I was called into the Executive Minister’s office and let go. I was told that my reason for dismissal was that I am “not a good fit for this church.” I’ve done nothing wrong, other than (in their opinion) not having the skill set to lead the church in worship as effectively as has been done in the past here at GCR. I do not feel that this public forum is the proper place to air my grievances about this, so I will not elaborate at this time. Sherri and I are understandably shocked and hurt. The only thing I will say about this is that it is a shame that I have never really been able to let them see the real me. I have tried to tailor my style of worship leading to fit a package that they were desiring. I was never able to move the church to a point that I could feel free to cut loose and lead the way I would like (which in my opinion this church needs badly… a new and refreshed approach to worship). Maybe this in itself is a sign that I am not a fit. The elders have been gracious to give me a long period in which to find new employment. I have committed to my children that we will not be moving. The change from Corpus Christi to Midland was devastating to my kids. It has taken them, Ashley especially, months to recover their smile. It has only been in the past few weeks that I have seen them return to normal. I’ll not mess that up again. Also, my wife has just begun teaching in the Midland school system. She is working with special needs children in a local Jr. High. So unless God throws us a really big curve ball, we are staying in Midland for the foreseeable future. Please pray for our family as we enter this new period in our lives. Pray that I will be directed to the job I am supposed to have and have the wisdom to recognize it. Sherri and I still firmly believe, even through all the troubles of the change, that we were supposed to move to Midland. God made it pretty clear. It turns out that GCR was just the tool to bring us here. So now we wait on God to show us the real reason. Homecoming is a little over a month away. Homecoming for Lubbock Christian University. I was in the graduating class of ’86, the last class to walk the stage under the LCC moniker. Problem was, I still needed 4 hours of foreign language when I did the graduation ceremony. It took me a year to finish a Spanish correspondence course from UT. By the time I had done it, I was booted back to the class of ’87 and my diploma arrived with the wrong major. It said LCC, but wrong major. So I contacted them and they sent a replacement with the correct major, but it now said LCU. So, I have a diploma from LCC for a Bachelor of Science, and a diploma from LCU for a Bachelor of Music Education. On that note, pun intended, I have been adding new arrangements to our praise team portfolio. If you’ve read any of my earlier posts, you may have seen the discussion over the new song of the month and the problems with licensing. We have forged ahead, just without recording. Just so you’ll know (and in case you are interested in seeing it), the first song we added was Everlasting God by Brenton Brown. It went very well. The arrangement works great for church and it’s been well received. This Wednesday we introduce I Will Boast by Paul Baloche. I’ll let you know how it goes. “I like routine. There’s something about predictability that brings a little bit of peace. It’s like putting on an old worn shoe that’s been broken in just right. It’s rather comforting. “There are times when routine is not that good, especially in our spiritual walk. Since my children were born, I have either prayed over them or with them every night before bed. That’s a routine I want to continue until they are gone to college. The routine of praying will continue, but I do not want my prayers to be “routine.” It is very easy for me to slip into the same prayer from night to night. I want my children to grow up knowing not only the importance of prayer, but also understanding that prayer is an open conversation with God – not a repetition of a daily mantra. “Worship is much the same. While there is comfort in routine, we cannot allow our worship to become “rote.” Songs and prayers that once stirred the soul can become overly familiar and loose some of the meaning that moved us in the beginning. The Word of God encourages us to express ourselves in a fresh way. Six different Psalms specifically tell us to “sing a new song.” Isaiah tells us to, “sing to the Lord a new song, His praise from the ends of the earth.” In the closing chapters of the Bible, twice John hears the masses of heaven singing a “new song” before the throne. The Bible is replete with encouragement for us to seek fresh praise. “There are many ways to achieve this and we wish to offer one more. About once a month, we will introduce a new song during PowerPoint on Wednesday evenings. These songs will find their way into the Sunday worship, as did Everlasting God this morning. Hopefully, they will offer a new insight into the ageless promises of a sovereign God. I’ve been wrestling with how to introduce new songs to our church. I saw a thread on Keith’s blog a while back about just this thing. Unfortunately, most of the solutions presented on there didn’t quite work for us. I’d prefer not to introduce a new song in the Sunday morning service (except for the times when I do it not knowing it’s new to everyone… oops). So we are going to do the “New Song of the Month” approach. We meet on Wednesday nights for our PowerPoint service (it has nothing to do with the software). Once a month I will introduce a new song to the church. In order to keep it in their memory, it will be made available on our website immediately afterward. We plan to offer the written arrangement as well as a short recorded version of the arrangement. I have no idea how many will take advantage of this. We’re going to give it the old college try anyway. At the very least, it will drive a few more folks to our website. I’m sure it will be an educational process to get people to realize that they can download songs from our site for free. We’ll see. Look for the “New Song of the Month” section on the GCR website here in the next few days. It’s hard to believe that it’s only been a little more than a week since I’ve officially started work here at GCR. With the moving, new job, new school, new everything… it feels more like a couple of months. I’ve been so busy I’ve not even been able to wash my car. It still has bird poop from Corpus on the roof. I may leave it there for memories sake. My first official Sunday went well, I thought. The most important thing is that God was honored. The program flowed well and the theme was carried throughout the morning. The central idea was expressed in several different formats; song, message, scripture, and video. It culminated in the special offering for single parents, which ended up way beyond anyone’s expectations. All in all, it was a great morning. For those interested, I’ll post the order here in a moment. The kids are doing very well. Ashley is loving her new dance studio. Austin is adapting, although we really need to get him spending some time with new friends. Sherri is having some medical difficulties, so please say a pray for her, wherever you are. >As I speak to other worship leaders across the country, I am amazed at the varied processes they use to plan worship services. Anyone who does it very often understands this is a process that is constantly changing, but I thought I would explain how I go about it. Maybe it will spur some ideas in someone else. First, the entire thing is bathed in prayer. Everything starts there and it continues throughout. That can’t be understated. Another driving concept behind this form of worship planning is the holistic nature of worship. I believe that everything presented on that one hour Sunday morning should work to drive that day’s particular theme home. The message, songs, prayers, anything that happens, should all be consistent in nature. People have different learning styles (writing, reading, listening, visual, etc). This translates directly to what happens in worship as well. Beyond that, please understand that it takes a while to get the system to the point I am about to explain. It is a long and lengthy process of recruiting and training people. Ideally, the process begins at least two months out. I divide worship planning into four different committees. The first is the Theme Team. Their job is to create a sermon series relevant to our Mission, current events, holidays, or needs of the church family. This is a small team with the Sr. Minister as the head. This way, the teaching minister does not have to kill himself to come up with an entire series or direction all by himself. They assist him in roughing out the ideas and main points of the series. When this is complete, the series is turned over to the Resource Team. They spend two weeks compiling everything they can find that even remotely connects with what the Theme Team has set forth. Almost nothing is out of bounds for worship resources. Songs, videos, skits, special presentations, liturgical dance, scriptures, etc. There is no bad idea here. What someone may consider a bad idea may spur a good thought in someone else. If they cannot find what they are looking for, suggestions can be made for creation, e.g. write a song about the indwelling of the Spirit, or a drama about heartbreak. When they have their “toolbox” filled, they turn it over to the Design Team. This team is lead by the Worship Minister. Their job is to take the ideas presented by the Theme Team and the tools presented by the Resource Team and form them into a whole for a great worship experience. This is where the holistic nature of worship really comes into play. The Design Team makes everything flow together smoothly and thematically. At one design session they may plan just one Sunday or several. It depends on how much time they have, how full their toolbox was, how far ahead the Theme Team has gotten, etc. But at this point, the goal is to have a completed worship service three weeks out from the actual Sunday. This allows plenty of time for rehearsals, studies, set creation, multimedia creation and tweaking. The fourth and final team is the Review Team. This is headed by one person, but the membership of the team rotates. On each Sunday, this team is given a form that includes important information: the theme of the day, the resources used, etc. The main question is, “did we hit the mark?” This is completed and turned back in where it is shared with everyone else allowing for course correction and lessons learned. All this for one Sunday. As you’ve probably figured, this process is constantly revolving. In order to stay ahead, the Theme Team has to be forecasting their direction pretty far ahead of time. The Resource Team has to constantly be cataloging ideas and resources. The Design Team has to stay on top of the schedule so that they can remain at least three weeks out. And the Review Team has to keep their membership rotating and trained. We rotate so that the same people don’t sit in worship every Sunday and do nothing but “critique” and miss worshipping. We train the reviewers so that they gain a better understanding of how we plan, and possibly allow for them to move up to one of the other committees in the future. As I said it’s pretty involved, but that’s the point. The more people are involved, the more your church identity shows up in the worship. The more people are involved, the more invested your church body becomes in the worship. I have not yet commented on the mini-retreat that I participated in at GCR last week. Most likely, I will not say too much. Most of the folks there will be processing it for quite a while. It was not the meeting many expected it to be. Golf Course Road has hired Kevin Callahan of Callahan Studios to remodel their worship center. As I mentioned in an earlier post, Kevin does not approach a “re-dux” in the way most architectural firms do. He and his team like to learn all about the church culture before they make suggestions about remodeling. But in that process, Kevin and his team challenge the church leaders as to what they really believe and why they believe that. I knew going in that this was going to be very different. One of the people on the creative team was Sally Morgenthaler. 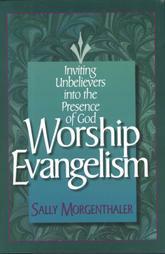 Sally wrote a ground shaking book in the late 90’s entitled Worship Evangelism and she has become a dominant voice in the emerging church movement. I am fairly sure GCR had no idea who was coming to challenge them. And boy howdy did she ever challenge them. 80% of the first day of talking consisted of Sally asking questions. She probed deeply into what GCR was about, what they wanted to be, what was holding them back, and what it would take to go to the next step. Most of the folks left that meeting in what I would call a mild state of shock. I titled this entry “Deja Vu” because this vein of talking seemed so familiar. This is exactly what our church, Christ Family Fellowship, has been through over the past two years. We have challenged everything we do as to the reason behind it and the justification for continuing it. It was a highly painful process, one that resulted in many friends walking away. One that also resulted in a church comprised of 70% new believers. It took us several years to work through these issues. Sally opened it all up in the space of 8 hours. No wonder they were in shock. I’ll tell you more about the meeting as time passes and the GCR leadership catches their collective breath.